In this work, a strain, Brevibacillus agri DH-1, isolated from the soil of eastern coastal china was used to remove m-dichlorobenzene. Impact of Fe (III) on m-dichlorobenzene removal in a biotrickling filter is studied. After 48 h culturing, the optimal concentrations of Fe (III) is obtained according to microorganism growth and m-dichlorobenzene separation in a biotrickling filter. The predicted optimal concentration of Fe (III) is 4 mg/L. 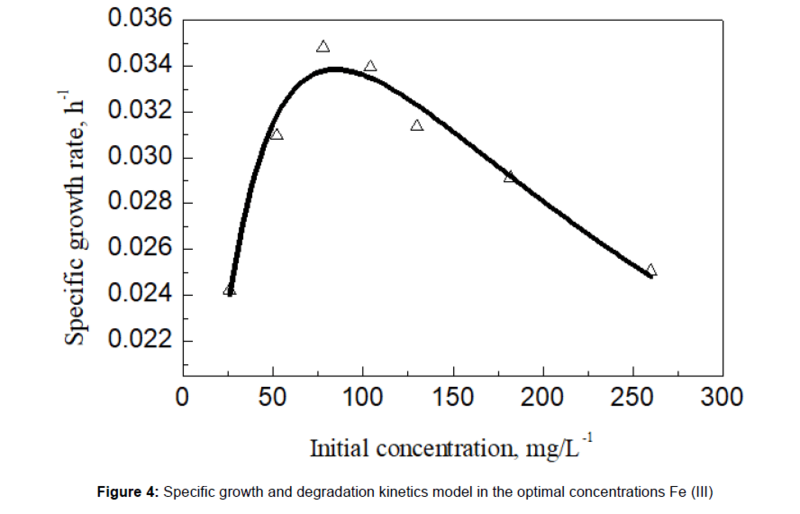 The fitting of Haldane-Andrews model for growth kinetics are still suitable in the optimum concentration of Fe (III), and the values of μmax, Ksi and KI were estimated at 0.07 h-1, 46.21 mg.L−1 and 155.49 mg.L−1, respectively. Degradation kinetic was also fitted well by the pseudo first-order, but the reduction of ln(c) becomes faster with incubation time due to the effect of Fe (III). In addition, the chloride ion concentration and C12O enzyme activity was measured, and it showed that Fe (III) could considerably improve the efficiency of antichloration and ring opening. M-dichlorobenzene is an important raw material that is widely applied to the production of synthetic resin, and pesticides . Many endocrine disorders, immune dysfunction and cancer appeared because of the direct emission of m-dichlorobenzene to our atmosphere . Comparing biotrickling filter with other treatment method (physical methods and chemical methods), it is a good choice for m-dichlorobenzene treatment . Moreover, the concentration of nutrients and pH in BTFs can easily be controlled by adding fresh medium, acids and bases [4,5]. In our previous published work , we found that the strain Brevibacillus agri DH-1 is capable of degrading m-dichlorobenzene, and can be applied in a biotrickling filter for m-dichlorobenzene removal in stable and valuable manner. However, the removal efficiency was lower in contrast with other studies [7-9]. Therefore, the enhancement of m-dichlorobenzene removal in a biotrickling filter is necessary. Many researchers found that some metal ions have a promoting effect for the microbial activity. Among various options, Fe (III) has significant auxo-action as a basic element of microbial organisms and the appropriate Fe (III) concentration is one of important premises for microbial growth [10,11]. In this study, the effect of Fe (III) on M-dichlorobenzene removal in a biotrickling filter is comprehensively analyzed based on our previous findings. The optimal Fe (III) concentration was obtained by analyzing the toxicity and optimizing of Fe (III), whereas the kinetics analysis was studied when the Fe (III) was added. Moreover, the effect of Fe (III) on antichloration and ring opening in the degradation pathway was evaluated. M-Dichlorobenzene (>99.5%) was obtained from Sinopharm Chemical Reagent Co., Ltd. (Shanghai, China), whereas FeCl3 (≥ 99.99% metals basis) was obtained from Shanghai Aladdin Biochemical Technology Co., Ltd. All other chemicals are available commercially with high purity. The applied mineral salts medium (MSM) contained the following composition: KH2PO4 0.5 g, Na2HPO4 0.5 g, (NH4)2SO4 2 g, CaCl2 0.01 g, MnSO4•H2O 0.13 mg, ZnCl2 0.23 mg, CuSO4•H2O 0.03 mg, CoCl2•6H2O 0.42 mg, Na2MoO4•2H2O 0.15 mg, AlCl3•6H2O 0.05 mg added per liter of water . M-Dichlorobenzene was added as the sole carbon and energy source. The composition of the nutrient solution is described . The strain Brevibacillus agri DH-1 (GenBank accession JX170207) was used in this study which is described in our previous work. A BTF was used in the present experiment as presented in Figure 1, and the specific details are also mentioned in the previous work . 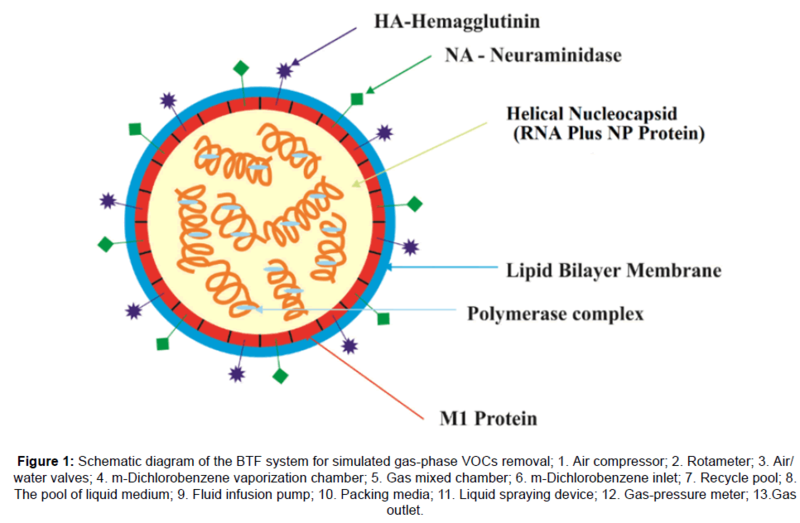 Figure 1: Schematic diagram of the BTF system for simulated gas-phase VOCs removal; 1. Air compressor; 2. Rotameter; 3. Air/ water valves; 4. m-Dichlorobenzene vaporization chamber; 5. Gas mixed chamber; 6. m-Dichlorobenzene inlet; 7. Recycle pool; 8. The pool of liquid medium; 9. Fluid infusion pump; 10. Packing media; 11. Liquid spraying device; 12. Gas-pressure meter; 13.Gas outlet. In this experiment, the optimal concentrations of Fe (III) were added in 50 mL of MSM, and then the 250 mL culture flask was sealed with silicone rubber septa. 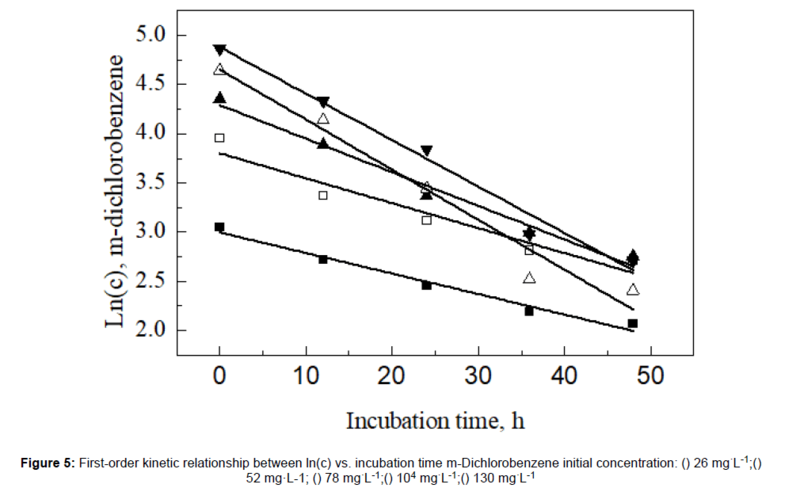 The different concentrations (26, 52, 78, 104, and 130 mg/L) of M-dichlorobenzene were added in the sterilized culture flask [14,15]. The microbial suspension was injected in the culture flask. Toxicity of the metal ion Fe (III) was represented using a spectrophotometer (6T, Beijing Purkinje General Instrument, China) to measure the OD values at a wavelength of 600 nm. The dry cell weight and m-dichlorobenzene concentration was analyzed after cultivation of the gradient of time. All the experiments were performed in duplicate. Chloride ion concentrations and C12O enzyme activity were used to show effects of Fe (III) on degradation pathway. Fe (III) was added in culture flask, a sample was withdrawn after every 6 h to test Cl. A crude enzyme fluid was placed for 20 min from the logarithmic phase to detect the enzyme activity. The enzyme activity was computed as follows [16,17]. Where, △A is the change of light absorption value per minute, V is the volume of enzymatic reaction system (L), ε is the molar extinction coefficient (1/mmol/cm), and M is the quality of protein in enzymatic reaction system (mg). The optimizing experiments were carried out using a BTF. The BTF was successfully started up with an M-dichlorobenzene inlet concentration of 278.13–1098.75 mg/m3 at an empty bed residence time point (EBRT) of 60 s (It was showed in the previous work). In the steady-state stage, for seeking the optimal concentration of Fe (III) in biotricking filter and studying their effects under optimal concentration, various concentrations of Fe (III) was added to BTF. To ensure steady state of the bioreactor, BTF was resumed to the reference condition for about 5 d after each experimental condition . In the experiments of growth of strain DH-1 and M-dichlorobenzene degradation, the growth of the strain was represented by measuring CDW. Herein, 50 mL of cell suspension was filtered and dried (24 h, 105°C) to weight for CDW. M-dichlorobenzene degradation was monitored using a gas chromatography (Clarus 580, PerkinElmer, USA) with an HP-VOC column (60 m × 0.32 mm × 1.8 μm) and a flame ionization detector (FID). Chromatographic conditions were described in HJ. CO2 production was detected by injecting 200 μL of gas-phase samples into a gas chromatograph (7890A, Agilent Technologies, USA) with an HP-Plot-Q column (30 m × 0.32 mm × 20 μm). The column and thermal conductivity detector (TCD) temperatures were 40°C and 200°C, respectively. The concentration of Cl- in the culture flask was determined by an ion chromatography (ICS-2000, Dionex) with an Ionpac AS19 (250 mm × 4 mm; Dionex) column after filtering through a syringe filter (0.22 μm, Bojin, Germany) as described previously . The results of toxicity experiment are illustrated in Figure 2. It can be seen that the variation trends of microbial growth were similar. The absorbance quickly rose at the first 12 h then, its rising speed became slow until 24 h or 36 h. Finally, the absorbance was decline, and then leveled off. Positive effect on absorbance was observed for concentration range between 0.4~5 mg/L for Fe (III). 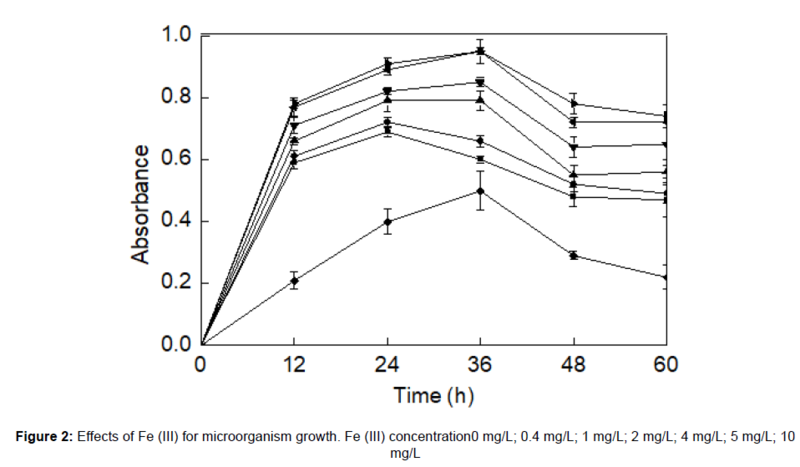 Especially, at concentration of 4 mg/L and 5 mg/L Fe (III) showed a great enhancement for microorganism growth. The effects of Fe (III) for m-dichlorobenzene removal are presented in Figure 3. A significant enhancement of RE was observed in BTF 2 when the concentration of 3, 4, 5 and 6 mg/L was applied for Fe (III). The biggest increment was tested at day 45 and the ER of M-dichlorobenzene was increased from 75.04% to 81.28% when Fe (III) concentration achieved up to 4 mg/L. Increment of 6 mg/L Fe (III) was very low comparing with 4 mg/L and 5 mg/L. The ER of M-dichlorobenzene was just increased from 74.28% to 76.18% denoted that higher Fe (III) had a little inhibitory effect for M-dichlorobenzene removal. The results showed that optimal Fe (III) concentration is 4 mg/L. Figure 3: m-Dichlorobenzene removal at different concentrations of Fe (III) in BTFs. () inlet concentration, mg·m-3; () outlet concentration, mg·m-3; () removal efficiency (%). Many researchers are committed to dynamic simulation of experiments [20-22]. In this work, the result of growth of strain DH-1 and M-dichlorobenzene degradation at optimal Fe (III) concentration is shown in Figure 4. The M-dichlorobenzene loss and biomass endogenous decay rate was negligible (data not shown). In the previous work , Haldane–Andrews model was chosen to fit experimental data. Specific growth rates and Haldane–Andrews model were calculated from the following equation. Where vi is Specific growth rates at of strain DH-1 at different M-dichlorobenzene concentrations (h-1), c is the cell concentration (mg.DCW·L−1) , t is incubation time (h), Ci is the liquid-phase substrate concentration (mg·L−1), μmax is the maximum specific growth rate (h−1), Ksi is the Half-saturation constant (mg·L−1), KI is the inhibition constant (mg·L−1). The values of μmax, Ksi and KI was estimated at 0.0398 h-1, 20.84 mg·L−1 and 372.53 mg·L−1 respectively, and a decline trend was observed for the specific growth rate when initial concentrations higher than 88 mg·L-1 in the previous work  After adding of Fe (III), the result is shown in Figure 5, when the value of μmax, Ksi and KI was 0.07 h-1, 46.21 mg·L−1 and 155.49 mg·L−1, respectively. Moreover, the highest specific growth rate appeared when the Initial concentration was about 85 mg·L−1. Comparison of growth kinetic parameters for the current study is obtained from previous studies that indicate that Fe (III) cannot change the rule of growth, but can accelerate the specific growth rate and the relationship of initial concentration and specific growth rate appeared in advance. Where Ct is the m-dichlorobenzene concentrations at the time t (mg•L-1), C0 is the c M-dichlorobenzene initial concentrations (mg•L-1), K is the First-order kinetic degradation constant (h-1), t is incubation time (h), and K absolute values respectively were 0.0212, 0.0259, 0.0291, 0.0407 and 0.0388 in the different M-dichlorobenzene concentrations (26 , 52, 78, 104 and 130 mg•L-1). After adding 4 mg/L Fe (III), K absolute values became 0.0208, 0.0253, 0.0341, 0.0508 and 0.0472. K absolute values are close to the result of previous work for lower concentrations (26 and 52 mg•L-1) indicating that m-dichlorobenzene concentration was limiting condition in lower concentrations and Fe (III) cannot play a role in enhancement of removal process. When the M-dichlorobenzene concentration was 104 mg•L-1, degradation rate had a significant improvement. In this experiment, we can speculated that Fe (III) has a better positive effect for m-dichlorobenzene removal and the realization of function mainly was achieved through promoting the microbial activity and growth. The variation of Chloride ion and C12O enzyme activity for m-dichlorobenzene degrading for 48 h was analyzed after the cultivation environment was added 4 mg/L Fe (III), and the result is described in Figure 6. From Figure 6, we can know that dechlorination was promoted significantly by the optimal concentration Fe (III). However, the highest chloride ion concentration is closed to the result of previous work indicating that Fe (III) just improved dechlorination and had little effect on breaking through the M-dichlorobenzene concentration restricting. As can be seen, the changes in C12O enzyme activity for the current study is higher than the previous work showing that the Fe (III) is helpful for accelerating ring opening of the m-dichlorobenzene degrading. 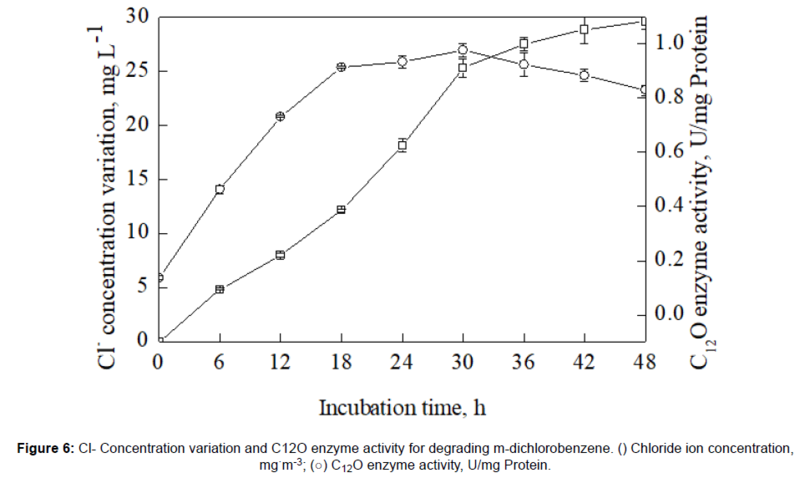 Figure 6: Cl- Concentration variation and C12O enzyme activity for degrading m-dichlorobenzene. () Chloride ion concentration, mg·m-3; (○) C12O enzyme activity, U/mg Protein. The optimal concentration of Fe (III) for m-dichlorobenzene removal by Brevibacillus agri DH-1 in a biotrickling filter is computed to be 4 mg/L. The kinetic analysis proved that Fe (III) can considerably promote the growth of strain DH-1 and m-dichlorobenzene degradation without changing the rule of growth and degradation. In addition, the optimal concentration of Fe (III) also has positive effects for dechlorination and ring opening of the degradation pathway. This work was supported by National Key Research and Development Plan “Causes of Air Pollution and Control Technology Research” (2016YFC0209200) ，the National Natural Science Foundation of China (Grant No. 51778612) and Natural Science Fund for Colleges and Universities in Jiangsu Province (17KJA610005). Mato MM, et al. Experimental and predicted data of excess molar enthalpies and excess molar volumes for the ternary system (1,3-dichlorobenzene + benzene + 1-chlorohexane) at T = 298.15 K. J Chem Thermodyn. 2014;73:190-196. Geelen LMJ, et al. Confronting environmental pressure, environmental quality and human health impact indicators of priority air emissions. Atmospheric Environment. 2009;43:1613-1621. Rene ER, et al. Biodegradation of BTEX in a fungal biofilter: Influence of operational parameters, effect of shock-loads and substrate stratification. Biores Technol. 2012;116: 204-213. Kennes C, et al. Bioprocesses for air pollution control. J Chem Technol Biotechnol. 2009;84:1419-1436. Zamir SM, et al. Styrene vapor biodegradation in single- and two-liquid phase biotrickling filters using Ralstonia eutropha. Chem Eng J. 2015;268:21-27. Yang BR, et al. Kinetic analysis and degradation pathway for m-dichlorobenzene removal by Brevibacillus agri DH-1 and its performance in a biotrickling filter. Bioresour Technol. 2017;231:19-25. Sang BI, et al. Effect of carrier size on the performance of a three-phase circulating-bed biofilm reactor for removing toluene in gas stream. J Microbiol Biotechnol. 2008;18:1121-1129. Liu C, et al. Removal of H2S by co-immobilized bacteria and fungi biocatalysts in a bio-trickling filter. Process Safety and Environmental Protection. 2013;91:145-152. Runye Z, et al. Styrene removal in a biotrickling filter and a combined UV–biotrickling filter: Steady- and transient-state performance and microbial analysis. Chem Eng J. 2015;275:168-178. Rusevova K, et al. Nano-sized magnetic iron oxides as catalysts for heterogeneous Fenton-like reactions—Influence of Fe (II)/Fe (III) ratio on catalytic performance. J Hazard Mater. 2012;241–242:433-440. Papanikolaou G, Pantopoulos K. Iron metabolism and toxicity. Toxicol Appl Pharmacol. 2005;202:199-211. Wang L, et al. Enhanced removal of ethylbenzene from gas streams in biotrickling filters by Tween-20 and Zn(II). J Environ Sci. 2014;26:2500-2507. Zhang LL, et al. Degradation of chlorobenzene by strain Ralstonia pickettii L2 isolated from a biotrickling filter treating a chlorobenzene-contaminated gas stream. Appl Microbiol Biotechnol. 2011;91:407-415. Wang L, et al. Effects of surfactant and Zn (II) at various concentrations on microbial activity and ethylbenzene removal in biotricking filter. Chemosphere. 2013;93:2909-2913. Sala-Trepat JM and Evans WC. The meta cleavage of catechol by Azotobacter species. 4-Oxalocrotonate pathway. Eur J Biochem. 1971;20:400. Wang X, et al. Degradation pathway and kinetic analysis for p-xylene removal by a novel Pandoraea sp. strain WL1 and its application in a biotrickling filter. J Hazard Mater. 2015;288:17-24. Song T, et al. Effect of surfactant on styrene removal from waste gas streams in biotrickling filters. J Chem Technol Biotechnol. 2012;87:785-790. Barbieri P, et al. Alternative pathways foro-xylene orm-xylene andp-xylene degradation in a Pseudomonas stutzeri strain. Biodegradation. 1993;4:71-80. Leng SQ. Isolation of chlorobenzene degrading strain and its application in Bioaugmenting chlorobenzene-treating BTF. Master thesis: Zhejiang University of Technology.2011. Lee EH, et al. Characterization of methane oxidation by a methanotroph isolated from a landfill cover soil, south korea. J Microbiol Biotechnol. 2011;21:753-756. Pansuriya R and Singhal R. Effects of dissolved oxygen and agitation on production of serratiopeptidase by serratia marcescens nrrl b-23112 in stirred tank bioreactor and its kinetic modeling. J Microbiol Biotechnol. 2011;21:430-437. Dahili LA, et al. 2,4-dichlorophenol enzymatic removal and its kinetic study using HRP crosslinked to nano spray dried poly(lactic-co-glycolic acid) fine particles. J Microbiol Biotechnol. 2017;27:768-774. Li G, et al. Efficient bio-deodorization of thioanisole by a novel bacterium Brevibacillus borstelensis GIGAN1 immobilized onto different parking materials in twin biotrickling filter. Biores Technol. 2015;182:82-88. Padmanaban VC, et al. Kinetic studies on degradation of Reactive Red 120 dye in immobilized packed bed reactor by Bacillus cohnii RAPT1. Biores Technol. 2016;213:39-43.